Having flat feet can be painful, and cause discomfort. The best shoe for flat feet will help you to manage your problem. The shoes offer you arch support and cushioning in the right areas such as the midfoot, and stability. When you are setting out to find yourself a great shoe for flat feet you need to consider a few important aspects. No matter what shoe you need, whether it be sports such as tennis shoes for flat feet, casual or dress footwear, the features you need remain the same. Related: Best Shoes for Toddlers with Flat Feet. View the Best Shoes for People with Flat Feet, Below. What are the Best Walking Shoes for Flat feet? What Dress Shoes for Flat feet Pronation? Best Travel Shoes for Flat Feet? We have read countless reviews. We looked at both the negative and positive customer responses and used this to develop our list. We look at the type of support they offer. Considered the stability, durability and breathability offered by the shoe. When you are flat-footed, you will find that you are prone to foot or heel pain and discomfort after a long day on your feet. 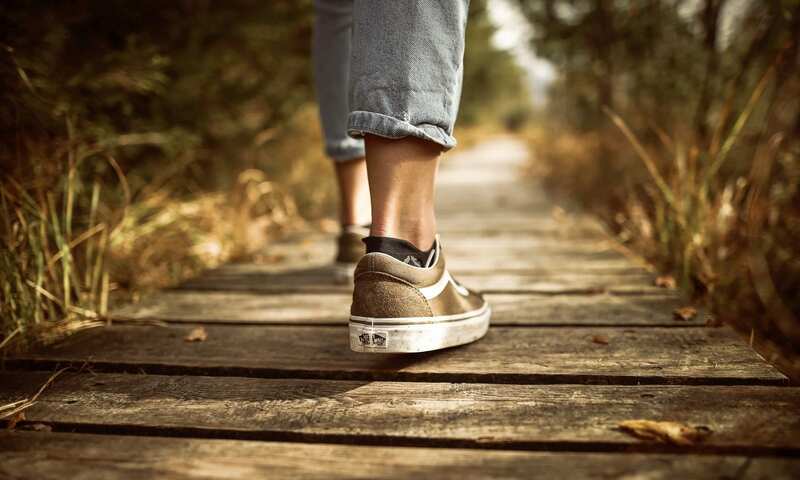 When looking for the best shoe that provides the support, comfort, and stability you need when suffering from flat feet, there are many aspects to consider. These include the material used to construct the shoe. The style of the shoe and whether it is gender specific. Consider how the midsole and sole are constructed. Consider the features the shoe offers to provide the greatest arch support. The difference between flat feet and so-called normal feet is simple. In flat feet. the arch of the foot fails to distribute your weight to the parts of your feet that can to cope with it. The ball, or forefoot and heel pain, or the rearfoot. are the areas that support your weight when walking. Flat-footed people need extra support in these areas. The inability to distribute their weight properly, flat-footed people tend to experience foot pain, heel pain, discomfort, and joint pain, especially in the hips and knees. There is no specific shoe that will help with flat feet. There are a number of shoe companies on the market that do cater for people with flat feet. Dansko is one that looks to provide working women with flat feet good arch support shoes. ASICS produces running shoes that are perfect for both men and women who run with flat feet. Then there are Clarks, ECCO and more. 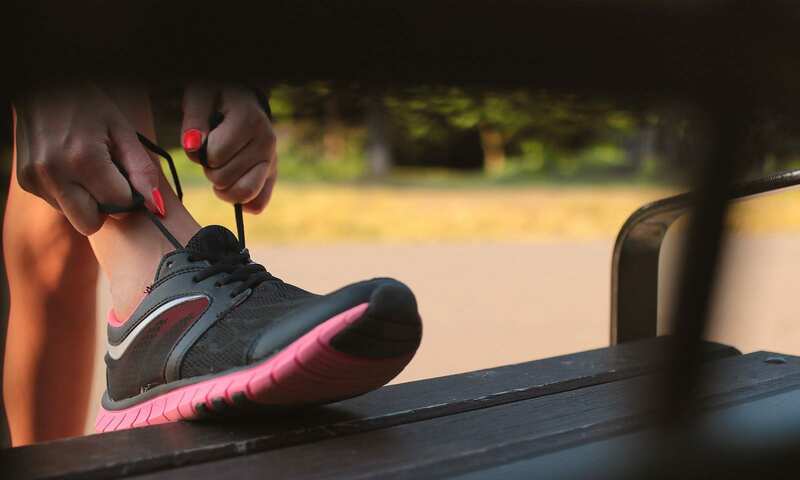 All of these shoe companies have recognized that people with flat feet require a little more support and comfort than others and have engineered stability shoes that focus on these aspects. So what is it that makes a great shoe for flat feet in men and women? This is one of the most important aspects to look for when you suffer from flat feet. Shoes that cater for flat feet men and women will not bend toward the middle of the shoe. The midfoot is an area that really requires great support. A shoe that has a stiff sole is the one that will offer the most support for your arches. Stiffer stability shoes are the ones that provide the support to help prevent over-pronation. The shoe should be stiff in the middle while allowing for flexibility in the toe or forefoot area. A stiff heel is also very important when the shoe comes to support. Flat-footed people are prone to rolling their ankles. The stability provided in the heel area is crucial. Stiff outsoles provide the arch support that prevents your foot from rolling inwards. Although it may seem that a stiff shoe could be uncomfortable that is not the case. Top stability shoes for flat feet offer the right amount of padding and comfort to counteract the stiffness of the shoe. A heel counter helps to resist pressure and this helps to prevent pronation as well. The other thing to consider is the different styles of shoes. The support and stability of the shoe will differ depending on the style of shoe you are looking at buying. Casual shoes are a great option when dealing with flat feet. A casual shoe with a firm heel counter will go a long way in making a day on your feet more bearable. Arch support is found in a number of different shoe companies. Selecting the correct shoe will depend on the fit, and style. Arch support insoles are also important to use if you require additional support. This is where removable insoles are helpful. When wearing shoes such as flip-flops, clogs, and boots without proper support can lead to great discomfort for people who suffer from flat feet. This is a great option however you must be willing to tolerate the very stiff nature of these types of shoes. The heel counters on these orthotic shoes are very hard and they often feature steel shanks. Some of the features that negate the discomfort stiffness causes are well-padded collars, heel-locking mechanisms, and built-in orthotic footbed technology. However, the downside of this type of shoe is often the look. The orthotic shoes are often not very flattering or fashionable. People with flat feet are prone to turning their ankles inward while running. This not only can cause injury but also put extra strain on your knees, ankles, and feet. 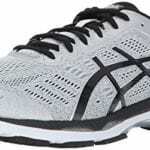 Many shoe companies today, such as ASICS, recognize this and have created stability shoes for flat feet that add a level of stability and control to prevent this pronation and provide a lot of cushioning in all the right areas. Running shoes for flat feet features a lightweight construction with breathable materials. Many of these running shoes also have removable insoles that can accommodate orthotic foot bed insoles or inserts. Motion control shoes are also very popular. These running shoes are especially good for people who suffer from extreme pronation. These shoes are engineered and designed to keep your ankle straight. They often feature dual density foam below the medial arch of the shoe. On the downside, these motion control shoes can seem to be very restrictive. The best sandals for flat feet offer arch support. When looking for sandals with the built-in arch support needed to allow your flat foot to function properly, you need to remember that sandals, by their very nature, lack the structures of normal shoes and due to that lack the ability to offer the full support flat-footed people require. 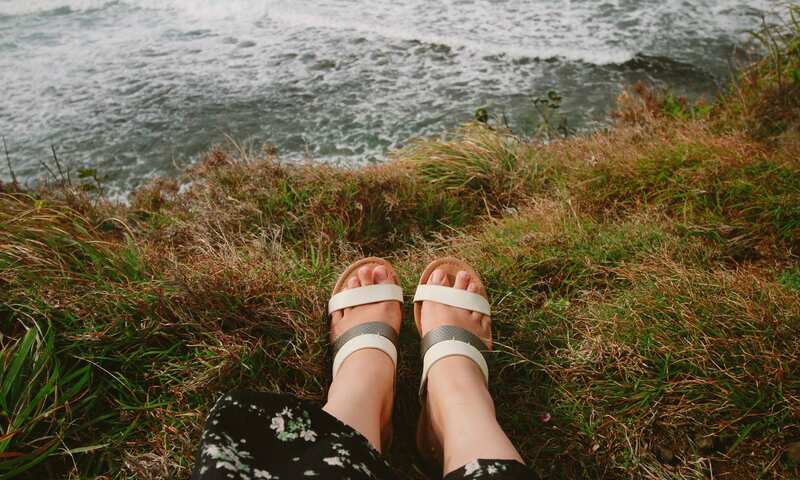 If you suffer from flat feet, try to wear your sandals for short periods of time when you first purchase them to make sure that you get the right support for your feet before braving spending a day in them. Support and stability are what you require when considering which shoes to purchase. The style of the shoe makes a big difference to the level of support you can expect from your shoe. Sandals tend to be less supportive. Running shoes require specific support to protect joints and ankles. Casual stability shoes make the best type of shoe for flat feet. Having the right footwear can prevent the foot or heel pain and discomfort caused by flat feet. So let’s take a look at shoes that work very well for people with flat feet. ASICS has produced a great shoe for absorbing shock in the Gel-Kayano 24 . They have taken into consideration the problems runners experienced using the Gel-Kayano 23 and upped their game to offer shoes with good arch support and a cushioned sole to give maximum comfort for people with flat feet. These shoes are feature packed. Designed specifically to give the flat-footed runner ultimate support from heel to toe, and to help in absorbing shock. One of the best athletic shoes for flat feet. It is a shoe that is perfect for training thanks to the cushioning provided. Designed for over-pronators and although a little pricier than some, they are well worth the money. The fit of the shoe is true, Jacquard mesh used on the upper allow it to wrap your foot with a glove-like fit and feel. It is a little lighter than the previous Gel-Kayano weighing in at a mere 11.4 ounces. One of the best running shoes for over-pronation. It features FlyteFloam & Fluidride midsole technology for great stability. This along with the guidance line midsole technology offers exceptional comfort. The Meta Clutch external heel-counter hugs the foot. Coupled with the integrated panel situated on the medial offers the best support. These flat feet running shoes feature the Dynamic DuoMax support system. They also feature an Ortholite x-40 sock liner. The rearfoot and forefoot GEL cushioning system, which absorbs the shocks from impact when running, is another feature that is designed to offer the most comfort for flat-footed male runners. Built as a training shoe for the avid runner. The shoe has exceptional durability with the rubber sole and jacquard mesh upper. The mesh upper allows for great airflow. Your feet will remain cool and dry throughout the run. The sole is made from rubber with an AHAR+ outsole. It has a great traction pattern which offers exceptional traction. It also provides extra cushioning for your feet as you run. The Gel-Kayano is an excellent option for those runners who suffer from flat feet. Designed to wrap your foot in comfort. Offering the best in support in the midsole of the shoe. Rearfoot and forefoot with Gel cushioning provided support in all areas. 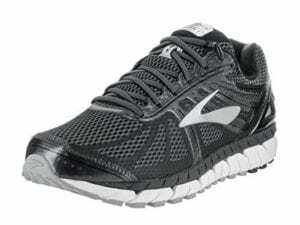 Designed to be lightweight and durable, this is one of the best running shoes for flat-footed men. ECCO has created a slip-on loafer that is one of the best men's dress shoes for flat feet. Not only are they very stylish, but are also extremely comfortable. Offering a number of features that are designed for the flat-footed man. These shoes can be worn with confidence. Great for an evening out, going to work, or having a casual day out with friends. The all-leather uppers of the shoe are sophisticated and stylish. They are available in various colors and will not break the bank either. It is easy to slip on and remove and offers the support men who suffer from flat feet need. The shoe features a removable leather insole. This makes it easy to replace with an orthotic if necessary. The footbed is entirely covered in leather and is padded to provides extreme comfort. The textile inner lining of the shoe absorbs moisture. This fantastic feature ensures that your feet stay cool and dry all day long. The heel is cushioned and this provides a softness in the toe area as well. The arch support on this top shoe for flat feet is exceptional. It will ensure that you do not suffer from pain and discomfort from walking or standing all day long. The shoe with its complete full-grain leather upper is extremely durable. Breathability is provided by the leather upper of the shoe. This material allows for great airflow keeping your foot cool and dry. The sole of the shoe is extremely flexible to allow for a full range of movement. The injected polyurethane outsole provides a shock-absorbing quality. This helps it absorb most of the impact when walking. A great, stylish looking men's loafer. It is versatile enough to wear to work, on a night out or just a casual day with friends. The full grain leather uppers offer an air of sophistication. They are extremely comfortable to wear. Designed to cater for men with flat feet. Offering features that offer arch support and cushioning needed for men who over-pronate. A great buy and at an extremely good price as well. After two years Brooks has produced an update of its Beast. These Brooks Beast shoes offers new and improved features. This version is perfect for those men who tend to over-pronate or suffer from flat feet. It not only is perfect as a running shoe for flat feet but also brilliant walking for shoes for flat feet. It may be a little more expensive than some other shoes for flat feet on the market but are well worth the price. Offering breathable uppers. Cushioning in the right areas allowing for a smooth and comfortable ride. Superb stability this is one of the best support shoes for flat feet that is available for men on the market. The comfort of the shoe is due to the cushioned feel of the shoe. The quad-density compression molded EVA foam midsole provides superb midfoot support and comfort. The uppers are constructed from spacer mesh. This is combined with fused urethane and synthetic leather. It is extremely lightweight while maintaining maximum stability. Memory foam used on the insole of the shoe disperses the shock of impact when walking. This reduces stress on your ankle. It also reduces stress on your Achilles heel. Protection from shock to knees and hips, this is one of the most comfortable shoes for flat feet around. A rubber outsole is coupled with a mesh and leather upper. This ensures that this shoe is extremely durable and will serve you well for many a long mile. The upper of the Brooks beast is constructed of mesh, leather, and fused urethane. Engineered to allow the foot to breathe, it encourages airflow, keeping your foot cool and dry. The rubber sole and wide outsole make this an extremely comfortable shoe. The outsole features hard carbon under the heel. It also offers blown rubber under the forefoot which is softer to support and soften the toe area. The Brooks Beast offers a smooth, comfortable and stable ride. Offering arch support. A flexible sole. A wide outsole and well-cushioned footbed that absorbs impact shock when walking. Men who suffer from flat feet who happen to have wide feet. Who tend to over-pronate. Who or suffer pain and discomfort in their knee joints, need to consider this shoe for flat feet. It may be a little more expensive than some, but you definitely get value for money in this great shoe for flat feet. A classic that will never lose its appeal. This boot is great looking, extremely durable and has a classic style. The perfect companion for you when out and about. Extremely comfortable and supportive. The perfect middle ground between smart dress shoe and casual sneaker. 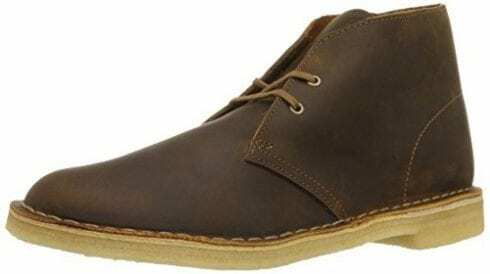 When talking desert boots, Clarks is the brand that comes to mind. Born in the 1950’s and based on the boots worn by the British officers during World War 1. You will not find a more comfortable or stylish boot on the market. Durable uppers and sole. Breathable and lightweight this classic boot is one of the best boots for flat feet. They are sure to keep your feet protected and comfortable, lending a great style to your casual look. The upper is constructed from all natural materials. These materials allow for good airflow. They will ensure that your feet do not suffocate even in hotter weather. Designed to counter over-pronation with their very comfortable and cushioned insole. They wrap your foot in complete comfort with a soft and flexible upper. The lace-up style of the boot ensures a superb fit and keeps your foot secure in the boot while walking. Designed as a boot that was made for working. This boot helps to soften the impact of walking with its soft sole and padded midsole. The leather upper is extremely durable. It is made to last. The sole is stiff for support and molds to your foot and supporting your ankle as well. The boot is engineered and crafted using all natural materials. This not only adds to the styling of the boot and the comfort it offers but also lends itself to breathability. It allows for air flow through the boot, keeping your feet cool and dry all day long. The sole of the shoe is rubber with excellent traction. The crepe outsole has remained exactly the same for more than sixty years. The natural rubber used is soft and flexible while remaining stiff enough to allow you to stand or walk all day. The flexibility of the sole will not constrict your movement. The crepe sole is lightweight and will not weigh your foot down. A great boot for flat-footed men, this is a classic that will lend a touch of style to your outfit. Designed to not only give your foot a great deal of support and comfort, but it is also extremely durable. The flexibility of the rubber outsole allows your foot a full range of movement. These boots are perfect for wearing with casual pants, jeans or chinos. They are one of the best boots for flat feet that will not break the bank either. Merrell has always been a go-to brand shoe that supports your feet throughout the working day. Well known for their work shoes, The Merral offers non-slip soles. They also feature cushioned and comfortable footbeds. This is perfect for those that spend the majority of their day on their feet. Flat feet is a problem for a lot of men and having a work shoe that provides the support that they need is imperative. Another great feature of this leather slip-on is the Aegis antimicrobial treatment. This feature will help to prevent any unwanted odors and keep your shoe fresh smelling all day long. With these shoes, you get the best dress shoes for flat feet. They are stylish with a polished look, will allow them to concentrate on their jobs and not the state of their feet. There are many features on this great slip-on shoe designed to cater for men who suffer from flat feet. These include an AirCushioned heel. This will absorb the shock of impact when walking and bring superb stability to the shoe. An Ortholite footbed to provide superb comfort for the midfoot and a padded collar. The EVA footbed of the shoe is also removable. If you need to have orthotics you can easily replace them with a more comfortable fit. The arch shank is constructed from molded nylon. This features will enhance the midfoot support of the shoe. The full-grain leather upper with a Strobel design makes it extremely durable. It also lends a touch of style to the shoe. The upper and inner of the shoe is designed to allow for great airflow. This keeps your foot cool and dry throughout the long working day. This slip-on style shoe offers an Encore 2 outsole. This sole features sticky rubber grips which are perfect for both indoor and outdoor use. The traction is very good and it is non-slip as well. A stylish work, or casual shoe. 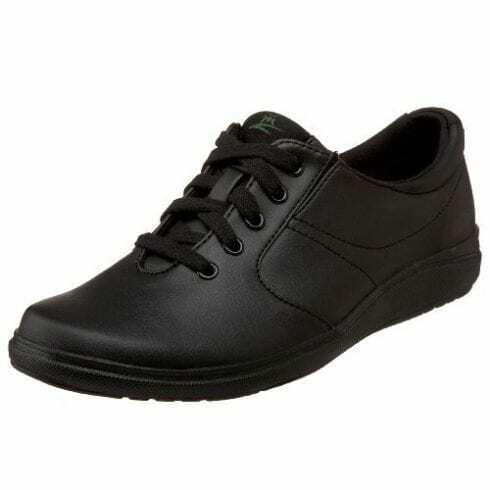 It offers exceptional support and comfort to the man who spends their day on their feet, these are one of the best work shoes for flat feet on the market. It offers a non-slip sole. A full-grain durable leather upper. A removable footbed combined with an AirCushioned heel. This shoe is worth taking a look at when considering which work shoe for flat feet you want to purchase. This is a sandal for the women who love to be outdoors, KEEN has created a sandal that can cope with any and all conditions. If you love to walk along the beach dipping your feet in the water and still have the support you need for flat feet. 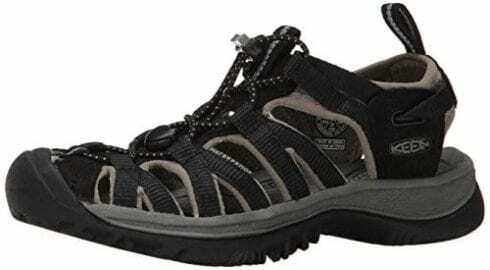 This sandal will prevent pain and discomfort in your foot due to flat feet, If you love the outdoors you will love it. A sandal that is more than just a sandal. Designed to offer women with flat feet the arch support they need. This makes an outing into the country, or to the mall, comfortable one. These sandals for flat feet are constructed from hydrophobic mesh lining. This makes it perfect for walking in water. The midsole of the sandal is compression molded EVA. It also features a metatomical footbed design. This ensures that your midfoot is adequately support and it offers the kind of arch support women with flat feet require. The sandal follows the natural contour of your foot. It cradles it and supports it while you enjoy your day. The sandals are designed to keep your foot snug and secure. The elastic cord lacing system allows you to adjust the sandals for the perfect fit. Also featuring toe protection for when you are walking in water and cannot see below the surface. As we all know, wearing sandals in water can lead to unwanted odors. However not with the KEEN as it features the Cleansport NXT which controls odors naturally. The mesh lining of the shoe is reinforced and extremely durable. The sandal also features a hydrophobic mesh so it is water resistant. Easy to wash and maintain. This is not a closed shoe and therefore the air can move freely over your foot keeping them cool and dry. The outsole of the shoe is constructed from rubber. It has a very good tread pattern. This provides superb traction, perfect for when walking on wet slippery surfaces. A sandal that features a metatomical footbed design. It is engineered to provide you with arch support and exceptional comfort in a sandal. The hydrophobic mesh lining, and bungee lace capture system, make it durable and water resistant. One of the best sandals for flat feet these are perfect for the active outdoorswomen. Grasshopper is a brand that has always been associated with comfort and support. The Women’s Stretch Sneaker is one of the best dress shoes for flat feet women. They are perfect for the women who require a little extra in both comfort and support. Flat feet can lead to pain and discomfort in the foot as well as pain in other joints such as your knees. The features of this shoe include cushioning that provides the comfort you need. It will support your arch and midfoot. It also has shock-absorbing qualities to prevent pain in your knee joints. A sneaker for flat feet women. It offers a memory foam footbed which is designed to cushion your foot and provide the arch support. The heel is rounded. This offers your foot a great landing pad which allows the shoe to absorb the shock of impact when walking. This feature also helps protect the knee from impact pain. A quilted footbed with a soft jersey knit lining and lace-up closure all combine to ensure a comfortable fit. The padded collar and tongue add to the sneakers level of support. These shoes with good arch support and a cushioned sole are the perfect shoes for active women who spend long hours on their feet. The faux-leather upper of the shoe is not only extremely lightweight it is also very durable and offers great support to the shoe. The uppers are breathable, allowing for good airflow through the shoe keeping your foot cool and dry. The Drilex lining of the shoe is designed to wick away moisture adding to its level of comfort provided. The flex grooves on the outsole of these shoes for flat feet women ensure that you get excellent traction. The flexibility of the rubber sole will keep your foot stable. It also allows for a wide range of movement while keeping your foot well supported. One of the best sneakers for flat feet women these shoes are designed to offer relief from fallen arches which cause pain and discomfort. Shock-absorbing cushioning in the midsole and heel and exceptional arch support make this a great shoe for flat feet. The lace-up closure ensures your shoe remains securely in the shoe and adds to the stability of the sneaker. Like its male counterpart, this is one incredible shoe. Its well-designed construction features a number of aspects that will definitely keep your foot supported and comfortable throughout the day. It provides arch support and shock-absorbing qualities needed when suffering from flat feet. 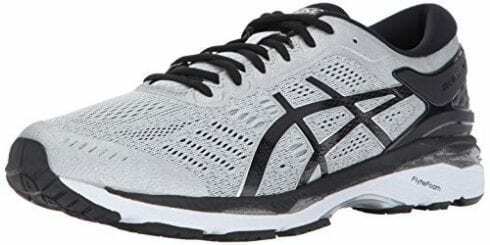 ASICS is a brand that has produced some great running shoes for flat feet and the Gel-Kayano 24 improves on previous efforts to offer an even better. More supportive shoe for women with flat feet that love to run and work-out. Midsole support, stability and comfort from heel to toe are just some of the great features you will find on this running shoe for flat feet. These arch support running shoes are engineered to provide you with a stable and extremely comfortable ride and cushion your feet from impacts. This is achieved through integrated panels which are found on the medial side and an external stability clutch counter. The fit of the shoe is snug and hugs the foot providing excellent support. The FlyteFoam midsole technology along with the rear and forefoot GEL cushioning system provides the support you need in your midfoot and also the stability you require when suffering from flat feet. The Jacquard mesh upper and the rubber sole offers great durability to this running shoe. The shoe is designed to offer exceptional breathability through the textile mesh upper and textile lining. This coupled with the ComforDry X-40 sock liner keeps your foot cool and dry throughout the day. The synthetic outsole is designed to be stiff enough to give you the stability and support required when looking for running shoes with good arch support. It is just flexible enough to allow for a good range of foot movement. One of the best women’s running shoes for flat feet, the Gel-Kayano 24 is designed to offer superb arch support and cushion your feet from impact. The mesh upper hugs your foot keeping it stable inside the shoe. The external stability clutch counter adds to a great overall fit. 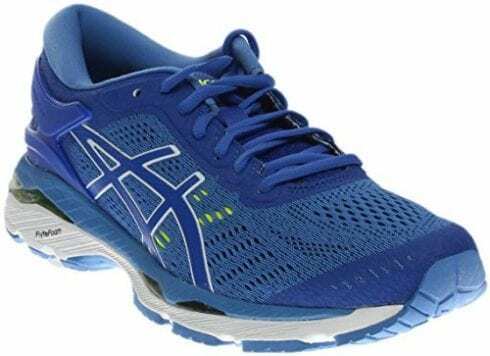 The Gel-Kayano 24 is one of the best ASICS for flat feet and will give you a smooth stable run. Women who need arch supporting comfortable shoes for work need not look further than the Fawna Mary Jane. 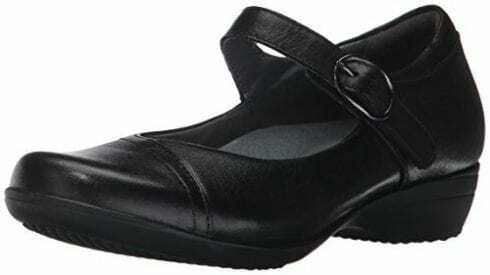 This Dansko women's dress shoe for flat feet is stylish and comfortable. Coping with fallen arches can be painful and cause discomfort, especially for the women who spend her days on her feet. Finding a top arch support shoe is vital for working women and no matter what price you pay, they will be worth the expense. 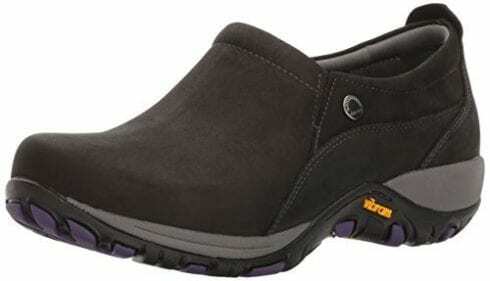 These are really cute, stylish work shoes that are engineered specifically to address problems caused by flat feet. The low profile style of the shoe gives it a wonderful look and feel. This Mary Jane features a molded EVA footbed which is padded and helps to support the midsole of the foot. The footbed is also removable and easy to replace with orthotics should they be required. The integrated tuckboard coupled with the steel shank provides the stability you require when suffering from flat feet. The built-in arch support received from the memory foam footbed which is designed to follow the contour of your foot will ensure you have a pain free, comfortable day on your feet. Featuring a hook-and-loop closure you will be able to adjust it to ensure a great fit. The leather upper with a soft textile lining is extremely durable. An abrasion resistant sole adds to the durability of the shoe. The textile lining of the shoe provides the breathability. The shoe allows for great airflow, keeping your foot cool and dry. The rubber sole of the shoe is solid while maintaining some flexibility. Offering energy return you will find it keeps your foot energized all day. Offering non-slip qualities it adds to the stability of the shoe. Fashionable, stylish this leather Mary Jane shoe is perfect for the women who suffer from flat feet. A great women's dress shoe for over-pronation it provides the support and stability you require for all-day comfort. A replaceable insole allows you to use an orthotic if required. The memory foam, triple-density EVA footbed provides superb stability and support for flat feet women. One of the best women’s shoes for fallen arches, you will not regret spending that little bit extra on this dress shoe. It should be no surprise that Dansko makes another appearance on our list of the top shoes for flat feet. Dansko is a brand that is dedicated to providing some of the best work shoes for women who suffer from flat feet. 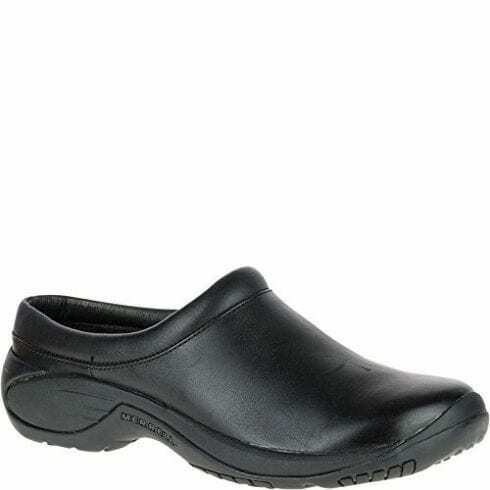 The Patti Flat slip-resistant shoe is not only cute and fashionable, it is also engineered with features that will make for a very comfortable day on your feet at work. Spending long hours on your feet during the day can cause great discomfort in women with flat feet. Dansko has designed its dress shoe with excellent support, stability, and comfort to ensure that you do not suffer from the pain fallen arches can cause. The triple-density EVA insole is constructed from memory foam to provide exceptional support in the midsole area. This feature is essential to provide the stability you need when suffering from flat feet. The Natural Arch technology of the shoe provides the arch support required. The insole is also removable for if you should require fitting orthotics to cope with your foot issues. The Dupont Sorona Fibre used in the lining of the shoe will wick away moisture keeping your foot dry, while the CleanSport NXT controls any unwanted odors. The upper of the slip-resistant shoe is constructed from soft suede which is treated with 3M Scotch Guard Protector. This combined with the rubber sole makes the shoe ultra-durable. The material used on the upper of the shoe is extremely breathable and allows for great airflow through the shoe keeping your foot dry and cool all day long. The Vibram Rubber used to construct the outsole of the shoe is stiff enough to provide the support you need while still maintaining enough flexibility to remain comfortable. The seam is sealed and waterproof to protect your feet from spills. The non-slip traction provides exceptional stability for women who spend their day on their feet. Working women who suffer from flat feet need a slip-resistant shoe that will provide them with the stability and support they require to prevent pain and discomfort. A stylish looking suede flat shoe the Patti from Dansko fits the bill as the best dress shoe for women with flat feet. A lightweight, breathable shoe with great durability it will definitely suit the women who spends her day standing or walking. Moisture-wicking technology, removable and replaceable insole and odor-preventing technology are features that make this a stand out shoe for flat feet. New Balance provides one of the best walking shoes for flat feet for women. These walking shoes feature a compression molded EVA midsole, providing the arch support you need. The ROLLBAR technology prevents you from rolling your ankle when walking. The insole is removable and replaceable to enable you to select an orthotic if required. A synthetic, breathable mesh upper provides the breathability to give your flat foot great airflow. A flexible leather upper supports your flat foot while providing exceptional comfort. New Balance recognizes that men and women have different needs. Like the women’s 928v3, the men’s shoe features all the same comfort and support needed. This shoe, however, caters to the male foot which tends to be broader and larger than women’s. The brethable mesh upper provides breathability, while the compression molded EVA midsole provides the arch support required. The one-piece glass fiber rollbar technology provides excellent stability. A great looking shoe with a leather upper which is flexible and wraps your flat foot in comfort. Fashionable and stylish is what women look for in a work shoe. The Dansko Women’s Patti Flat provides both, along with excellent support and comfort. The leather upper looks great and provides a level of support for your flat foot. The Vibram rubber outsole is not only waterproof but also slip resistant. The Dupont Sorona fiber wicks away moisture. The CleanSport NXT offers odor control. This is one of the best dress shoes for women who suffer from pronation. Dansko has always offered exceptional work shoes. They cater for the man who suffers from flat foot issues such as flat feet. The leather upper of the loafer gives it a stylish look. The cushioned insole provides exceptional comfort. A padded tongue and collar add to the comfort of the shoe. An EVA molded, memory foam midsole offers excellent support. A removable insole can be replaced with orthotics if needed. The tuckboard and riveted steel shank provide ultimate stability. The shoe also offers breathability and a moisture wicking inner liner to keep your feet cool and dry. The support and stability provided by the shoe are perfect for the man who suffers from flat feet. A great looking leather shoe. It features a mesh tongue, lace-up closure, and a biomechanical fit. A patented outsole with rearfoot grid system which provides the ultimate in stability. Pronation will no longer be a problem for women who like to see the work on their feet. A full-grain leather walking shoe. Featuring a brushed-nylon lining which is the perfect shoe for men who like to explore. The padded collar and tongue provide great comfort. The Gel heel pad with cushioning ridges provides the arch support, along with the EVA midsole. The rubber outsole is durable and provides exceptional traction. The shoe fits true to size. Men who have flat feet will love the support, comfort, and stability that this walking shoe offers. When running, you need a shoe that provides stability to prevent injury. You also need exceptional comfort. The Mizuno offers a smooth ride with ultimate support. The U4ic midsole provides the support in your midfoot that flat-footed runners require. The removable insole allows for orthotics to be used. The rubber outsole of the shoe is stiff. This provides the support while remaining flexible. The upper is breathable and flexible while also adding to the shoe level of support. Men who pronate when running require a specialized shoe. The New Balance running shoe offers the ABSORB crash pad feature, which offers incredible stability. The ACTEDVA LITE foam midsole is lightweight and supremely supportive. The FantomFit upper is lightweight with a comfortable fit for the male runner. All of these features make this one of the best running shoes for men with flat feet. Suffering from flat feet brings a lot of challenges to women who spend their days standing or walking or for female flat footed runners. 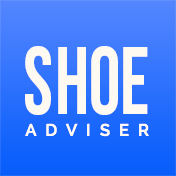 Finding the right shoe that offers the features you require to negate the foot and heel pain and discomfort fallen arches cause is essential. Stiff yet flexible soles, supportive midsoles that conform to your flat foot will ensure you get the arch support you need. Having a removable insole is great for if you require orthotics. Whether you are looking for the best cleats for flat feet or running and athletic shoes, or work dress shoes, you will find they all offer the same features that provide stability and support as well as comfort for flat feet women and men. High arches, fallen arches or flat feet do not have to cause you pain and discomfort if you find the shoe with the right fit and the right features to allow you to deal with this problem. Check that the shoe does not bend in the middle but at the crease of the toe. Shoes that are too bendy in the middle will not provide the support you need for flat feet. Most babies are born with flat feet, due to a pad of fat in the arch area of their flat foot at birth. This is because the muscles in their legs and foot cannot support arches when they first start to stand. To find out what else you can do to hep flat feet, ask Alice is a great place to start. We hope you enjoyed our article on "The 10 Best Shoes for Flat Feet", if so, please share and rate it.